The European Space Agency is working on a family of satellite missions called the Sentinels. These missions are owned and managed by the EU as part of the Copernicus programme, that is said to be one of the most ambitious Earth observation programmes to date. It aims to give timely, accurate and accessible information for better environmental management. Four out of six missions are operational at the moment. Sentinel data is open and easily accessible. Here we will give a small cheat sheet of various services connected to these missions. ESA provides a set of tools to work with Sentinel data. They can be downloaded here. The Sentinel-1 Toolbox is a collection of processing tools, data product readers and writers and a display and analysis application to support the large archive of data from ESA SAR missions. The Sentinel-2 Toolbox is a set of visualisation, analysis and processing tools for the exploitation of MSI data from the Sentinel-2 mission. Similarly, the Sentinel-3 Toolbox is made for OLCI and SLSTR data. If you’ve used these tools, we would appreciate some feedback. Sentinels Scientific Data Hub is a web based system designed to provide remote sensing data users with distributed mirror archives and bulk dissemination capabilities for the Sentinels products. The Hub provides complete, free and open access to Sentinel-1, Sentinel-2, Sentinel-3 user products. Data browsing portal (requires registration). Sentinel-2 data is available for anyone via Amazon S3, either over Internet or within AWS API, more info here. All Sentinel-2 scenes are made available, often within hours of production. Users can browse through the contents of the Sentinel-2 Amazon Public Data set via the Sentinel Image browser. Browse through data in full resolution via cloud GIS or using WMS/WMTS web services. Sentinel-2 postcards with access t o archive. A web browser for quick online image archive access and some RS tools. Sinergise manages ingestor, which is used to download and process data on AWS. A few more apps from Sinergise. A browser through Sentinel-2 tiles with possibility to download data from AWS. Continuous area of interest monitoring. 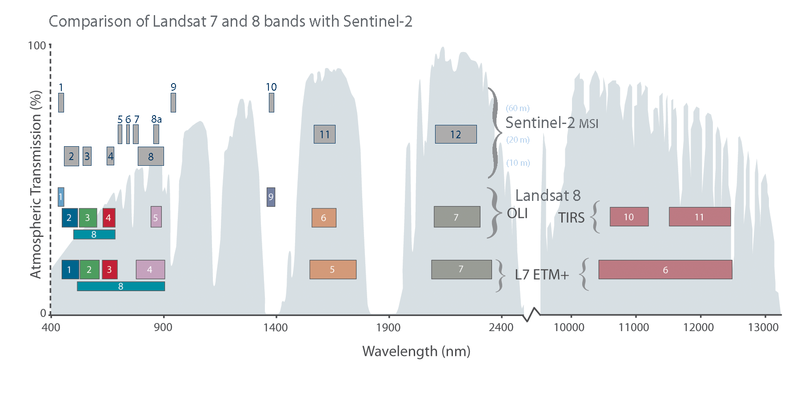 Search for Sentinel-2 and Landsat-8 data with an interactive preview. A utility for data download and processing, by Igor Garkusha, a Ukrainian developer. Videos of how it is used. Sentinel-2 and Landsat-8 data browser. Semi-Automatic Classification plugin for QGIS enables search and download of Landsat, ASTER і Sentinel-2 images. Sentinel-2 scenes can be added in ArcMap 10.4 and ArcGIS 1.3 Pro, and access is available to a wide range of band combinations and indices. Read more here. Please share any links on the Sentinel missions that we might have missed in the comments below! Writer and editor at 50 North. GIS engineer at Intetics Inc.
What do Earth’s surface temperature and emittance tell us?